WARNING: This article contains absolutely nothing whatsoever to do with firearms, but has everything to do with not being victimized by the bad guys who use the very technology we use on a daily basis to attack us. Last week, I had the opportunity to attend the 2012 Rocky Mountain Information Security Conference (RMISC), which was hosted by the Denver chapter of ISACA and the Information Systems Security Association. One of the breakout sessions I attended was Georgia Weidman’s talk on the glaring need for smart phone security. Besides leaving with the thought “…what ever happened to the day when these things were JUST phones? !” I was reminded of the fact that with the added technology and functionality, our “phones” need to be protected just as do our computers. Specific Dangers: Your smart phone does not just contain your contact list. Many people are using their smart phones to receive email, store documents, input calendar items, keep notes, store passwords, and various other useful things. So these devices now hold all kinds of potentially sensitive personal data that must be protected. If a piece of malicious software (malware) gets installed on your phone, it can steal this data and send it off to the bad guys without you even knowing about it. The SMS (text message) functionality, along with the Internet connectivity features, on these devices are often leveraged vehicles for “exfiltrating” your sensitive data. Not only is your personal data at risk, but also other information, such as your phone’s identity (the information that uniquely identifies your phone on the network), your geographical location, and information about the hardware and storage on your device can be disclosed. According to Ms. Weidman, the International Mobile Equipment Identification (IMEI) number that uniquely identifies your phone is as valuable to the bad guys as a credit card number, as this number is used by various apps to identify the smart phone as being yours when it logs on to the service. GPS information is also used to identify where you are located when using the services that you are accessing with your phone. Your phones can also connect to mobile WiFi hotspots, which means that they are as vulnerable to attack by malicious hotspots near your local coffee shop (disguising as legitimate hotspots) as is your laptop. Be careful about the networks you are connecting to. So what can you do? Two things that really stuck out from this presentation, in terms of minimizing risks and ensuring better personal security, were the need for: 1) Having a security suite installed on your smart phone, and 2) Be careful what you download, and what permissions are being asked for. Smart-Phone Security Software: In case you weren’t aware of this already, there are various apps out there that will help provide added security for your smart phone device. The problem is, however, that the tradeoff for additional security is often reduced performance. Do some research and find out which security suites have better reviews. I use the Norton Mobile Security Suite for my Android, and so far I haven’t noticed any huge or unbearable performance hits. Even the “lite” version will give you basic malware protection, but you can get additional features in the paid version for remotely wiping or locking your phone if it is lost or stolen. This is kind of a cool feature – I set up my spouse’s phone as a “buddy” so that if my phone is stolen or lost, I can send commands to my phone remotely. For example, if her specific phone number sends a “wipe” command to my phone, along with a password, I can wipe my phone remotely and erase all of my sensitive data. There are various other security suites out there such as Avast, Kaspersky, and Lookout. Take a look at the links, do some research and find out which ones have the features you need and the performance you want. Each link gives reviews to help you see what others are saying about each product. Application Security: If ever there was a need to read the fine print, reading those permissions that your new apps are asking for is it. 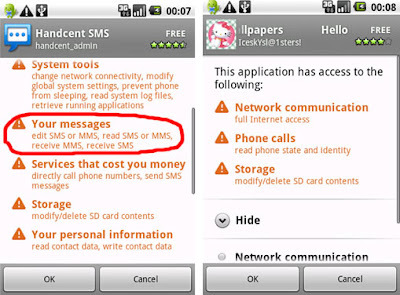 When you download a new app for a smart phone, the app will often tell you what permissions it needs in order to operate. Every time you download a new app, go ahead and read that list of permissions and take note of what that app needs to access in order to function properly. Here is a good article that further explains permissions and how you can get more information about each permission that is being asked for when you install an app. Smart phone security is every bit as important to keeping you from being an online victim as is protecting your computer. In the coming weeks, I will take a look at some additional ways to stay safe by addressing specific smart phone issues. It's up to you to Refuse to be a Victim! Article: What Can a Zero-Permissions Android App DO? ...Now – back to our regularly scheduled firearms programming. I love writing about America, this country that I love dearly. I also love writing about patriotism, emergency preparedness, firearms, and political issues. I have a number of websites all covering different aspects of these related topics. These websites do cost money to run, and since I do not accept advertising on the site (which would ruin your experience or clutter up the pages) I do use some affiliate links to help cover the costs. That means, if you buy a product through a link on this site, I may make a small commission. This does not in any way affect the amount you have to pay for the product, far from it. Since I have a relationship with these companies, I do occasionally get better deals from the companies I affiliate with, which in turn means you get better deals and bigger discounts. I also wanted to let you know that I have never accepted free products in exchange for a positive review. My recommendations are based solely on my own experiences with these products, and I only ever recommend products I pay for with my own money and personal use. ATCS(AW) USN (Ret), "The Gonz" is a Cyber-Security Operations Supervisor by day, and a 2nd Amendment/Gun Rights Activist and disaster preparedness enthusiast the rest of the time. He is a native Coloradoan, living in Fort Collins, Colorado. American Citizens have the absolute and God Given right to self-defense, as outlined in the US Constitution and 2nd Amendment. The 2nd Amendment is not about duck hunting. It is about law abiding citizens protecting themselves from tyranny and the deeds of evil people. Decent people deserve to have their rights protected, and they have the responsibility to voice their opposition when they see their rights being infringed upon. There is a lot of evil in the world today, and the bad guys do not obey the laws or care who they harm. The Supreme Court has made it clear that the police have no responsibility for our safety as individuals, but many politicians are so bent on taking away our means of self-defense. So for these reasons, The Gonz has chosen to use this blog as a vehicle to be outspoken about our rights and responsibilities. As for the rest of society, they can just mind their own business and stay out of our way. "The Gonz" is an NRA Certified Firearms Instructor, and an NRA Certified Range Safety Officer, with several years of advanced tactical firearms and emergency preparedness training. Certified CERT Instructor and a member of the Fort Collins CERT Team. Certified Law Enforcement AR-15/M-16/M-4A1 Armorer. Refuse to Be a Victim: Beware of Solicitors! How Long Until The Police Arrive?! Not All Thieves Are Stupid! Get These Guns "Off The Streets!" Gonzo's Garage (c) 2019. Awesome Inc. theme. Powered by Blogger.